When you are nearing the liberated Syrian city of Palmyra the first thing you hear is non-stop explosions rocking the air. Pillars of smoke bellow in the sky over the city. This is the Russian bomb squad which is currently clearing the city of bombs laid by Daesh militants. Many of them are very difficult to find so Damascus asked Russia for help. "Our president made a call to [Russian leader] Vladimir Putin," Gen. Samir Suleiman said. "Russia sent its specialists to Palmyra." On March 27, the Syrian Army reported the full liberation of the ancient city from Daesh. This has been the most significant victory over the terrorists since the military launched their operation in last September. Now the city looks like a military zone. Residents will have to wait for a few more days before they are allowed to get back to their homes. One of the terrorists’ biggest contingents was stationed to Palmyra, the second-biggest after Raqqa. Daesh seized Palmyra in May 2015 and turned it to a base for attacks on Damascus, due to its geographical position. 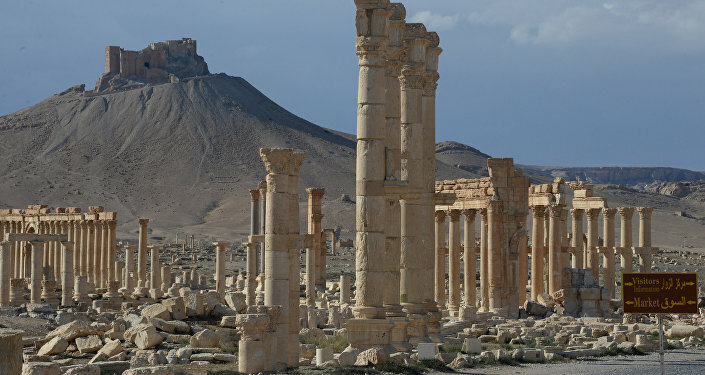 Militants could start their attacks from Palmyra and travel unnoticed for hundreds of kilometers. Their attacks were protected by two mountainous ranges surrounding Palmyra. Gen. Suleiman did not provide the exact number of personnel involved in the operation because this is a military secret. Sources close to Hezbollah said the number was 15,000-20,000 troops. The Syrian Army was supported by its allies, including popular forces and Hezbollah fighters. From the air, the operation was secured by the Russian Aerospace Forces. The Syrian and Russian forces coordinated all their actions. The majority of Syrian officers involved in the operation studied in a military academy in Moscow and can speak Russian. According to the general, Daesh lost nearly 1,000 militants killed. The official number of losses in the Syrian Army is 79. When fleeing Palmyra, the terrorists took everything they could take, including Yazidi female slaves they had for their soldiers. They destroyed power lines and the water supplying system. After the city was liberated the military found a mass grave with 50 decapitated bodies. A round fountain at the entrance to the archeological zone was turned into a torture site. There was a metal cage for prisoners. Militants threw decapitated bodies to the fountain until it was filled to the brim with blood. Syrian archeologist and the "keeper of Palmyra" Khaled al-Assad was among the prisoners. He refused to say where he hid treasuries and antiquities which Islamists wanted to sell in the black market. Russians are necessary allies for Syria, the article read. Europe supported the so-called moderate rebels and now is facing a major terrorist threat. "We’re protecting Damascus and the territorial integrity of our country. But thus we’re protecting Europe too," Gen Suleiman said. According to him, the restoration of Palmyra will take five years. The liberation of Syria would take "within a year." The offensive plan presumes the liberation of several strategic locations, the disruption of supply lines along the Iraqi border. The final steps are the march on Deir ez-Zor and – finally – the assault on Raqqa, according to the general.